I was diagnosed at the age 20. My first symptoms included: difficulty climbing stairs, tiredness, and some falls. Yes, my brother also has LGMD. In the beginning the greatest challenge was the process of accepting the disease. Given that I am a very independent person with a very active life, today my biggest challenge is making my desires compatible with what is possible, and finding strategies that permit me to reach my goals, understand my limits, and find solutions. Being able to overcome the obstacles I was facing, being a mother, being surrounded by my loved ones, and working every day at something I like. 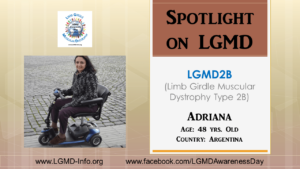 Working in an NGO for neuromuscular diseases, ADM Argentina, of which I was its president in 2011 and 2016. I had to redefine my projections for my future and in what fields I wanted to work, that was a big challenge. But it was possible, I was able to grow as a person, to live my daily life with more interest, to value what life has offered me, and to try to help other who are going through similar situations. 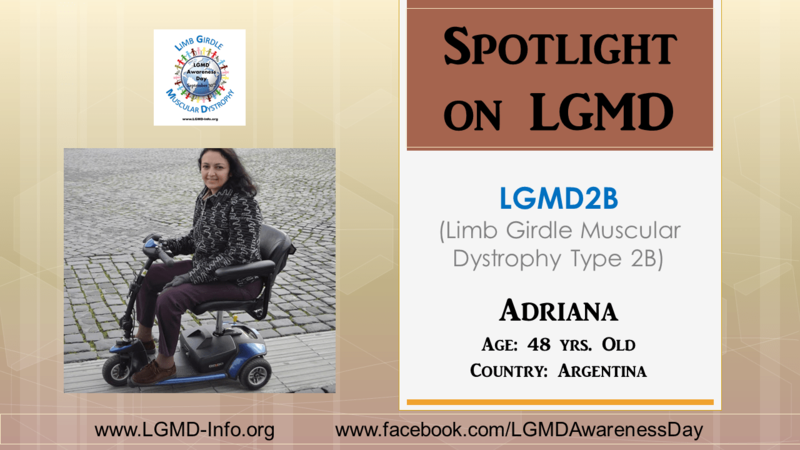 I would like the whole world to know about the existence of LGMD, its possible treatments, above all fight for early detection to improve our quality of life. Support diagnosis and research. I would go skating again.